If you are searching for “pool draining services“, “pool emptying service“, “pool water removal services” or “swimming pool draining service” in Ahwatukee, Arizona, BPC Pool Maintenance can help! We provide professional swimming pool draining services in Ahwatukee Arizona. We also provide pool draining information to help you become a more educated pool owner. To schedule pool draining, give us a call today at (480) 907-7959. Has your pool water turned green and you are thinking about draining the pool? If so, call us to chemically test your pool water first. You may not have to drain your pool. We will try everything in the book before we suggest draining the pool. We offer pool draining services for residential and commercial pool owners in the Ahwatukee area. Most of our customers use our pool draining services to lower the pool water enough to clean stains, clean pool tile, eliminate contaminated pool water and more. Not only can BPC Pool Maintenance drain your pool but we can also handle the cleaning of pool tile, stains of your pool walls and surfaces, and contaminated pool water removal. After draining the pool draining process is complete (plus any additional services you added on), we can then refill the pool with clean water again and add the right chemicals to get it ready for swimmers. Turn off the filtration system at the circuit breaker. Turn off the automatic fill valve. Find the access to the sewer line or retention basins to legally drain the water. Pool tile cleaning, chlorine blasting to remove stains and mineral deposits on your tiles and pool walls. Add the right amount of chemicals for the pool. Give an estimated time of when the pool water will be swimmable again. The reason that you may need to drain your pool is because the water has been subjected to harsh chemicals and a harsh environment because of hair, dead skin, oils, dust, minerals and other types of biological remains. Over time your pool will collect these materials and phosphates that are so small that your pool filter cannot filter them out. Plus, chlorine isn’t enough to treat the materials, because it only kills bacteria and algae. These materials are food for algae and bacteria. So if your phosphate and organic material levels are high, you may begin to struggle keeping the bacteria and algae under control. Other reasons to drain your swimming pool include: Green pool cleaning, pool tile cleaning and chlorine blasting of the pool walls and surface. Once your levels of materials get too high, your pool water won’t be able to use chlorine to kill the bacteria and algae in your water, which turns your pool walls and surfaces green. Many pool experts do recommend changing the pool water every 3 to 5 years, depending on the type of pool you have such as chlorinated, salt water, mineral water, or saline, etc., how often your pool is maintenanced, and climate of the pool. Read more about draining pools in Arizona. Pool water can’t be treated effectively after 3 to 5 years. It will take too much chemicals for your pool as well as money to clean the pool water once the water is over 5 years old. If you haven’t drained your pool every 5 years, you will have constant issues like cloudy water, algae growth, and a money pit of expensive pool chemicals. Contaminated pool water can also damage the pool walls and surface. Environmental things like hard water will cause calcium and mineral build up on the tiles which costs money for tile cleaning. Weekly maintenance is much cheaper than cleaning pool tiles. We specialize in cleaning and draining green pools. The green stains that are left behind after it drains, we can clean those up with our pressure washing services. We also provide tile cleaning for mineral and calcium buildup on tiles. We will follow the city codes for proper drainage of the pool water. According to AhwatukeeAZ.gov, swimming pool water must be drained onto your property first. If only some of it can be drained on the property, the next option is allowing the draining to go into the community storm water retention basin. The last option will be to drain your pool water into the sewer clean out which is normally in front of your home. After the pool has been drained, the pool will be easier to clean and maintain once there is fresh water in it. We will do the following steps to ensure that your pool water is properly drained. We will provide pool draining services for commercial swimming pools, residential swimming pools, neglected swimming pools, apartments, realtors, foreclosed properties, bank owned pool cleaning, and water features/tile cleaning. Do you still think you need your pool drained? Contact BPC Pool Maintenance to come out and check your chemicals first. We will diagnose your pool water to ensure that you actually need to drain it before an ounce of water is taken out. If you do in fact need pool draining, we will let you know first and prepare a quote to legally and safely drain and refill your pool water in Ahwatukee, AZ. To schedule your free pool draining estimate, give us a call today at (480) 907-7959. 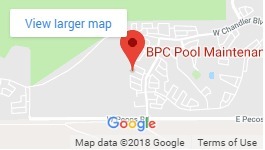 If you are searching for "pool draining services", "pool emptying service", "pool water removal services" or "swimming pool draining service", BPC Pool Maintenance can help!